Christmas set. 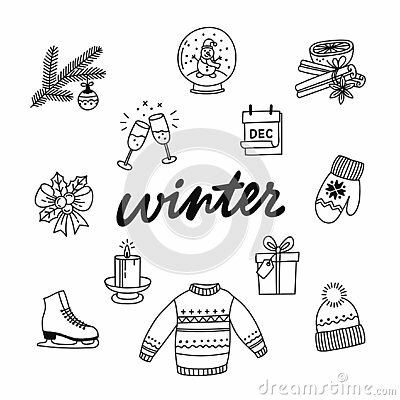 Illlustrations of winter items, holiday decorations and things. Big set of Christmas design element in doodle style. Hand draw collection New Year. Decorative drawing. Vector Set of Sketch Christmas Symbols. Clothes and Decorations. Noel, Christmas on french. Circle composition with Christmas decoration attributes. Patriot holds the flag of the United States.